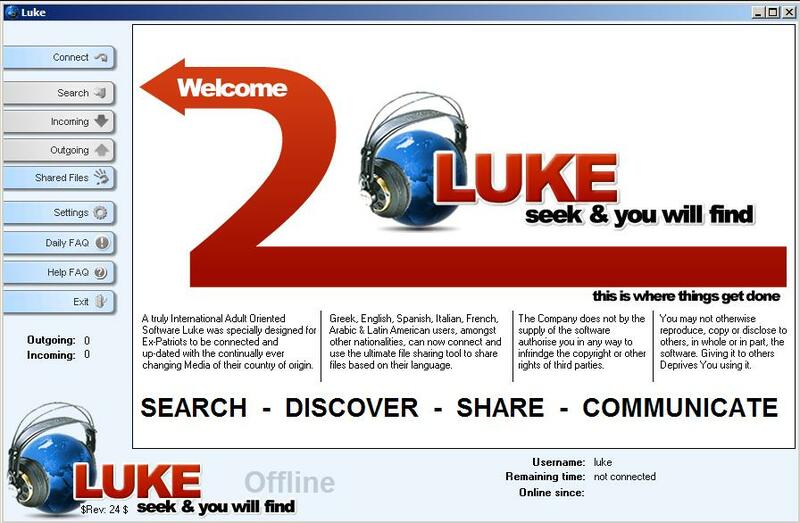 Lukep2p gives you instant connection, powerful search engine, access to a diverse and evolving Ethnic music-video community. Share & experience the International Ethnic music, including unique rare compilations, and great mood music of your country in 3 simple Clicks. Lukep2p was specially designed for Ex-Patriats to stay connected and up-dated with the continually ever changing Media of their country of origin. Find, download, and publish Ethnic oriented audio, video, images, and photos. ...... music-video community. Share & experience the International Ethnic music, including unique rare compilations, and great mood music of your country in 3 simple Clicks. LukeP2P was specially designed for Ex-Patriats to stay connected and up-dated with the continually ever changing Media of their country of origin. Find within Lukep2p your favorite Greek Music MP3 plus Greek Music Video, English Music MP3, Spanish Music MP3, Arabic Music MP3, Indian Music MP3, Italian Music MP3, Russian Music MP3, Swedish Music MP3, Turkish Music MP3, German Music MP3, Chinese Music MP3, French Music MP3 and Movie Films from your country of origin. Qweas is providing links to LukeP2P 20.0.39 as a courtesy, and makes no representations regarding LukeP2P or any other applications or any information related thereto. Any questions, complaints or claims regarding this application LukeP2P 20.0.39 must be directed to the appropriate software vendor. You may click the publisher link of LukeP2P on the top of this page to get more details about the vendor.